If you’ve been scouring dealerships throughout the Westchester, White Plains, and New Rochelle areas for the right luxury midsize SUV, you’ve no doubt come across the 2018 BMW X1. This vehicle delivers a lot with its impressive appearance, but it delivers under the hood, as well. Our team at BMW of Westchester is going to dive in a little further to give drivers like you a closer look. Our 2018 BMW X1 review will showcase this vehicle’s impressive components, features, and abilities. You’ll get a sense of its power and performance, interior space and comfort, and the media and connectivity features. Our review of the 2018 BMW X1 will help you see if this is the midsize SUV that you’ve been looking for. The BMW X1 comes equipped with a turbocharged 4-cylinder engine that’s capable of impressive feats. The paired 8-speed Steptronic automatic transmission features Sport and Manual mode, which allows drivers to transition between driving styles to suit their preference. The High-Precision Direct Injection reduces fuel waste by giving the engine exactly what it needs to perform. On top of its impressive horsepower output, the vehicle can go from 0-60 mph in 6.6 seconds. This midsize SUV offers a spacious and enticing interior. The driver’s seat features an 8-way power adjuster to provide maximum comfort. The Memory System allows you the convenience of automatically adjusting to your preferred mirror and seating preferences. The vehicle features SensaTec synthetic leather seating appointments to provide superior style and comfort. The rear seats can actually fold down to maximize the vehicle’s cargo space. Resting in the center of the dashboard is the iDrive 6.5-inch touchscreen display that can be used to access your media features to play through the vehicle’s 7-speaker HiFi Sound System that provides crisp and clear audio delivery. The vehicle features an MP3-capable CD player and HD Radio™, which allows for high quality listening of radio stations, most notably on AM stations as it reduces the hum that’s a common problem with talk radio stations. The BMW X1 also features connections through a USB port and an auxiliary input, Bluetooth® phone and streaming, and pre-wiring for SiriusXM® Satellite Radio. Did this 2018 BMW X1 review give you the insight and details that you needed to form your decision about this midsize SUV. 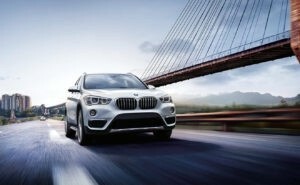 We hope that our review showed you what the BMW X1 offers, and what it can do while out on the road. But if you’re in need of more information, you can certainly stop by BMW of Westchester for a closer look, or even an informative test drive to really see what the 2018 BMW X1 can do. Schedule a test drive with us at BMW of Westchester, the dealership that’s always happy to help drivers in the Westchester, White Plains, and New Rochelle areas make the right decision when it comes to picking out their next luxury car.